Portable lighting like kerosene lanterns, candles and flashlights have long-been a necessity within households. You know why, suddenly out goes the electricity and the first thing we do is blindly start searching for the flashlight. Or maybe you’re working in a dark area and just need some extra light. Whatever the application might be, darkness often demands the need for a mobile light and if you are like me and own a MagLite flashlight, you should consider doing what I did. And, if you aren’t and own another brand of flashlight, don’t worry there is something here for you too! While we can all appreciate Thomas Edison, the light he invented is inefficient to the standard set today by the LED. The LED is able to burn brighter and up to 60 times longer than an incandescent. Once I researched and confirmed the longevity, efficiency and brightness of LEDs, the choice to switch was obvious. I immediately threw out the incandescent bulb in my MagLite and did a MagLite LED upgrade. 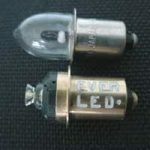 The first LED flashlight conversion bulb I bought was the EverLED, made by LEDdynamics. This particular flashlight upgrade is no longer manufactured, but it was a simple switch and like many still being made today, it dropped right into my MagLite. 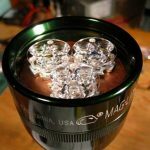 If you’re feeling nostalgic, here is a post from over 10-years ago that reviewed and compared the EverLED to a MagLite incandescent bulb. Generally, it highlights and documents the difference in brightness, beam pattern and run-time. Later, I will focus on new conversion kits that are available from us and use the latest LED technology. The second flashlight that I converted to LED light was my Mini MagLite. 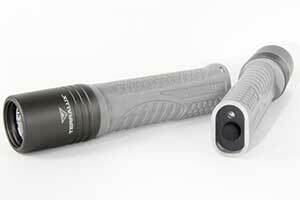 The Mini MagLite upgrade was built by TerraLux and at that time used a Cree XR-E with a two-prong plug. The switching of the bulb was fast and simple, but the change in light output and run-time was dramatic. I upgraded the Mini-Mag in my car, my wife’s car and the two in our home as well as my family members and a few friends. This product, which I will break down later is now called the MiniStar2 Extreme. 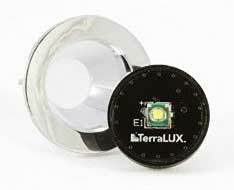 The name TerraLUX, mentioned earlier, is a company that in its early days focused almost exclusively on making LED upgrades for flashlights. It wasn’t long before they become a leader in that niche. That narrow focus and their use of the brightest LEDs in the market helped differentiate themselves from competitors. Ten plus years has gone by and while they are now owned by Lightstar they continue to provide compelling LED flashlights and MagLite LED conversion kits. 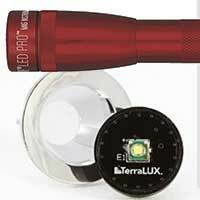 If you don’t have a MagLite product to upgrade, then I would recommend a TerraLUX LED flashlight. Their flashlights are competitively priced and built with outstanding quality craftsmanship. 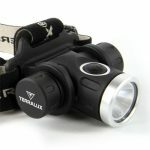 All their models have sleek designs, are machined from aircraft grade aluminum, include lifetime warranties, and use only the highest bin and brightest LEDs; one of TerraLUX’s most popular flashlights is the Lightstar 300. This is a small flashlight in size, but big in output. With a dual mode feature that is capable of 300 Lumens or 100 Lumens, this flashlight is ideal for a variety of applications. It can run at 300 lumens when more light is needed or at 100 lumens when maximum run-time is more crucial. The design of the Lightstar 300 is waterproof, made of aircraft aluminum and maximized for durability. And, as you can see from the picture it is available in bright colors with a strap and belt clip. Take a closer look at this light here. The Colorado 500 LED flashlight is seriously cool! It has more modes then the Lightstar 300 and is brighter too. At maximum output this unit bangs out 500 lumens and can shine more then 150 meters. The handle is made from high impact polymer which is really ‘grippy’; and the end of the handle has a tail switch for switching between Max, High, Medium and Low mode. For a complete list of specifications and features this light is located here and we highly recommend it. The best of the best is the TerraLUX TLF-TT-5; this light is superior in almost all regards when compared to every other LED flashlight. It’s beautiful and rugged with blindly bright light and all the modes one could want. Its niche is being tactical, which means that it can easily mount to weapons or combine with color filter cones for directing traffic and much more. Like the others, it also is waterproof, submersible and includes a lifetime limited warranty; here is the complete product page for more info. As described earlier, LED conversion kits are for upgrading from a cheap incandescent bulb to a LED bulb. Generally the conversion doesn’t require any tools, just unscrew the head of the light, take out the incandescent bulb and replace with the correct MagLite LED bulb upgrade. Below I will outline which bulbs work with what MagLite and the benefits/features of each. This conversion kit was designed for upgrading a standard Mini MagLite. At least in my area, the Mini-Mag was and still is a very popular flashlight; as mentioned earlier, many of my friends and family members also owned one and this was the kit I bought for them. As you may know, the Mini-Mag holds 2AA batteries in the handle and turns on and off by turning the head of the light. They are very small, rugged and reasonably priced; however, they come with a cheap incandescent bulb. 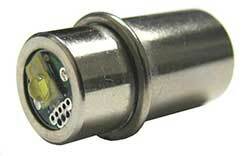 The benefit of the MiniStar2 Extreme conversion kit bulb is it uses a Cree XP LED, which outputs over 140 lumens. This is the brightest upgrade kit available for a Mini-Mag. Like the other kits below, this one also does not require tools for installation and can be done in less then a minute. Once the bulb is converted, the run-time with the LED bulb is 6 times longer than the incandescent. Here is the product page to make a purchase or to see the complete list of specifications. The larger MagLite that holds C & D Cell batteries also used to come with a incandescent bulb and the MiniStar5 Extreme is the perfect conversion kit. There are two options based on the number of batteries the MagLite holds. Both though are indentical in specifications and appearance. The benefit of this conversion kit, like the others, is increased run-time, longevity and light output. I replaced my second 3-Cell MagLite with the TLE-6EX-B almost 5-years ago and am still happy with it today. For those concerned with focus-ability, it retained it and almost was better as the beam created was even tighter. If your MagLite is 4-6 Cell then you want the TLE-6EX as it works correctly with the increased voltage from the extra batteries. My personal favorite among our portable lighting products are the headlamps. I’m not always thrilled to be using them, because if I am, it’s usually because I’m fixing or repairing the furnace, car, lawn care equipment, etc. The two we carry are the TLH-10 and TLH-50. The main difference being brightness, with respective maximum lumen numbers of 100 and 540. The TLH-50 is extremely impressive, we gave one to a friend for a Christmas gift and after the break his entire immediate family bought one. If you don’t have a headlamp get one here: TLH-10 or TLH-50. While on the subject of flashlights and before finishing up, it wouldn’t be right to not mention all our customers who have made DIY custom upgrades using our high-power component LEDs. If you like making things, don’t count out this option. For example, here is a link to a candle power forum thread where someone did just that with our products. Thank you for reading and let us know if you have question or request! 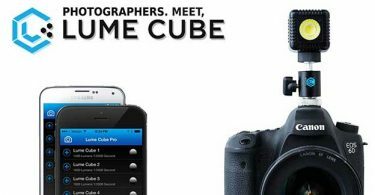 Lume Cube Review – 1500 Lumen LED Light Controlled Straight from Your Phone! 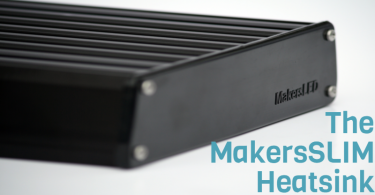 The All NEW MakersSLIM: Increased thermal control and sleek new look! How Does a 5mm LED Work? Technology enthusiast working to enable the use of LED lighting - Living in the Green Mountain State of Vermont with my family and working with a company like LEDSupply, that is helping to provide energy saving LED products, is a great place and platform to accomplish my lifelong goal of making a positive impact on our world. Stay in the know and receive DIY guides from our PROS, new product updates + exclusive promotions!